Aubrey David Nicholas Jasper de Grey (/dəˈɡreɪ/; born 20 April 1963) is an English author and biomedical gerontologist, currently the Chief Science Officer of the SENS Research Foundation. He is editor-in-chief of the academic journal Rejuvenation Research, author of The Mitochondrial Free Radical Theory of Aging (1999) and co-author of Ending Aging (2007). He is known for his view that medical technology may enable human beings alive today to live indefinitely. 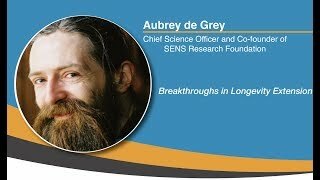 Dr. Aubrey de Grey is a biomedical gerontologist based Mountain View, California, USA, and is the Chief Science Officer of SENS Research Foundation. 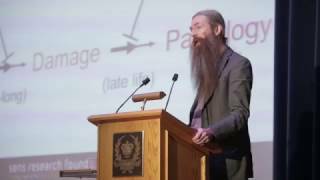 In this talk Aubrey De Grey details his thoughts on cryo-preservation as well as a synopsis of his thoughts on aging and how he sees technology shaping the aging process going forward. The first seven minutes are focused on cryo-preservation and he delves into the aging process after that. Dr. De Grey is known for his view that medical technology may enable human beings alive today to live to lifespans far in excess of any existing authenticated cases. De Grey's research focuses on whether regenerative medicine can thwart the aging process. This video is an introduction to his views on aging and what the world would look like after we have arrested the aging process. He works on the development of what he calls "Strategies for Engineered Negligible Senescence" (SENS), a collection of proposed techniques to rejuvenate the human body and stop aging. To this end, he has identified seven types of molecular and cellular damage caused by essential metabolic processes. SENS is a proposed panel of therapies designed to repair this damage. In this episode of Rhonda's FoundmyFitness show, Rhonda and Aubrey discuss the types of damage that cause aging, how aging results in a decrease in the capacity to repair damage, what role epigenetics play in aging, how people age at different rates, chronic inflammation as a driver of aging, factors that are in young blood that repair damage, the role of nutrition in aging, and recent technologies such as CRISPR, induced pluripotent stem cells that will advance anti-aging research and more.